night with supporters in the foreground. Like some of its neighboring cities, the San Leandro City Council approved Monday night a prohibition on the sale of flavored tobacco products. The council, however, diverged from Oakland and San Francisco, by sidestepping an additonal ban on menthol cigarettes, at least for now. The council’s votes was the second attempt in the last three months to enact a ban on flavored tobacco sales that include cigarillos, blunts and other often fruity-tasting tobacco products. 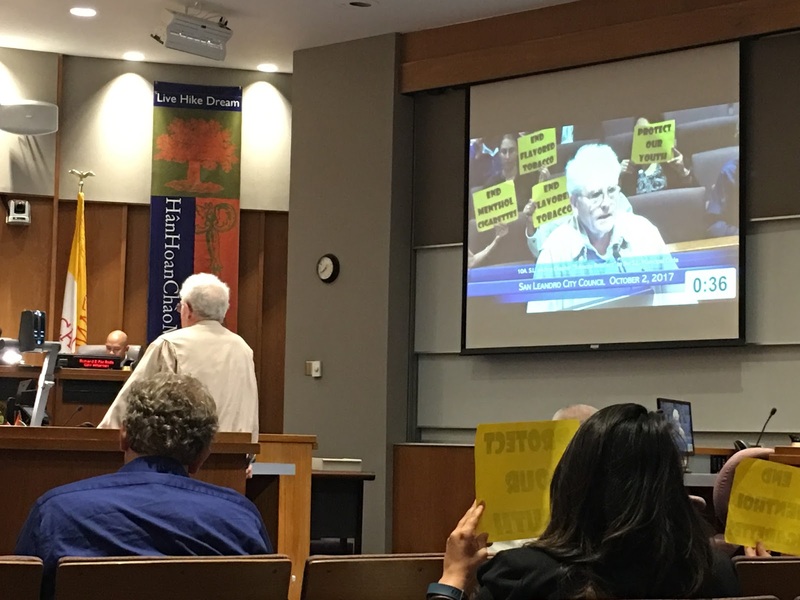 A similar proposal was discussed on June 5, but later sent back to the Council’s Rules Committee in an effort to resolve questions over the scope of penalties in the resolution. San Leandro’s ban, pending a second reading later this month, includes a $2,500 penalty for tobacco retailers after a second offense; a 30-day suspension on a third offense; and revocation of their license for three years after the fourth offense. But there was little discussion about penalties Monday night, at least on retailers. Instead, the council quibbled first over a motion by Councilmember Benny Lee to also enact penalties on clerks and underage youths who attempt to purchase tobacco products. Lee also asked that a provision be made in the ordinance to train clerks on rules and regulations every two years, along with signage in stores. The council, though, was not swayed by Lee’s proposal and the motion died. Councilmember Lee Thomas, clearly the most passionate opponent of tobacco, then attempted to attach a ban on menthol cigarettes, a type of tobacco product containing a minty flavoring, but classified by the federal government as apart from other flavored products. Thomas forcefully challenged the council to back the significantly beefed up proposal. “Are we going to go pro-business or go pro-youth life?” said Thomas. “Tonight we are taking a step toward protecting youth and keeping families together… It’s right there folks. We have an opportunity to take stand and do what’s right,” he said. While Thomas’s effort in June failed to move his colleagues, this time around he chose to offer compromises, including extending the ordinance’s effective date to a full year from passage to allow retailers to sell all their existing flavored tobacco inventory, including menthol cigarettes. He also proposed allowing tobacco-only stores for 21-year-old and up customers to sell menthols in San Leandro. But, like Lee’s motion, Thomas’s proposal also failed. Consequently, the pair of failed amendments resulted in a final vote that did not reflect some councilmember’s true stances. A vote to approve the staff’s recommendation was, 4-3, with Lee; Thomas and Councilmember Corina Lopez, due to support for a menthol ban, voting no. “I know this is not an issue that’s put to bed,” San Leandro Mayor Pauline Russo Cutter said after the vote. The comment is likely prescient. During a break Monday night, Thomas said he will attempt to schedule a discussion on a menthol cigarette ban at every subsequent meeting, if need be. Posted in ban, Benny Lee, flavored tobacco, Lee Thomas, menthol cigarettes, Pauline Cutter, san leandro, san leandro city council. Bookmark the permalink.